The renovation of Room 24 in the Boney Bean dorm could serve as the model for future dorm improvements at the Upper Campus. Here’s what Scott Garrett remembers about being the first resident of Room 24 at the Upper Campus in 1963: he recalls a garter snake slithering under the bed just out of reach. From then on, whenever he would come down from the top bunk, he would tread lightly. He also remembers the dorm as newly built – that it was crisp and clean and in mint condition. The trouble is, what was modern in 1963 is considered spartan now, and the dorms have steadily fallen into disrepair over the past quarter century. In many places, the drywall is cracked, and the overall appearance is stale and threadbare compared to the crisp modern dorm room Scott Garrett remembers. Enter big brother to the rescue. Earlier this school year, Spencer Garrett, a member of the first graduating class of the Upper Campus and a current member of the school’s Board of Trustees, joined forces with fellow Trustee David Trudeau to renovate Room 24, producing a prototype that could serve as a model for future dorm improvements. 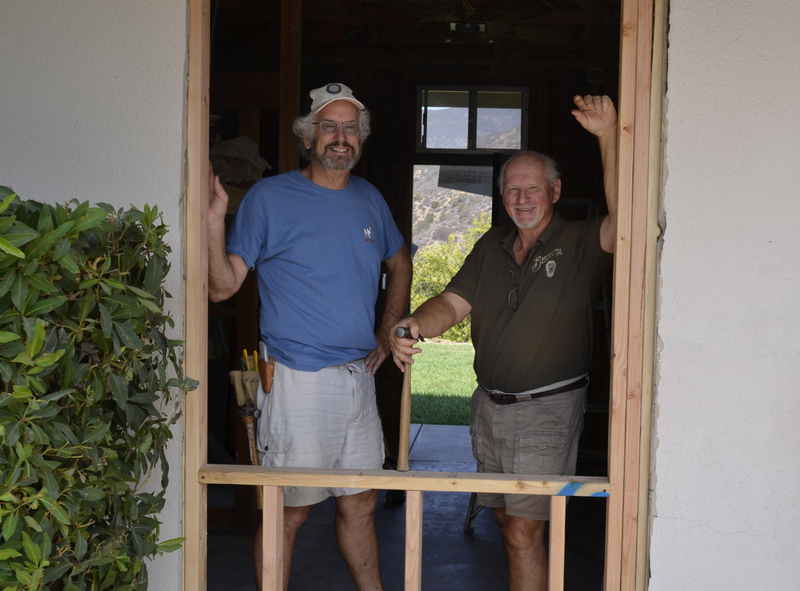 Together, with the help of the maintenance staff, the pair donated their time and money to gut Room 24, tearing out the furnishings and drywall, and laying the foundation for a sleek new dorm room. With that work largely completed, Room 24 now has new furnishings, a new door and a beautiful new picture window that overlooks Bedrock Square. In the next year, the school plans to renovate the entire Boney Bean dorm and then move on to renovate the two other dorm wings. There are a total of 26 dorm rooms to be renovated with an estimated cost of $100,000 per room, or about $700,000 per wing. The cost is elevated by the construction of new bathroom facilities and landscaping. OVS is making a point of keeping the project as cost effective and environmentally friendly as possible, adhering to a sustainability commitment to preserve natural resources and embrace “green” building practices. The renovation comes as a result of school leaders interviewing current students and alumni about the weak points of the Upper Campus facilities, and an awareness of why some students choose not to come to OVS. Future plans for the dorms include a separate outside bathroom facility, more storage space, better ventilation, air conditioning and infrastructure, doors that open outwards, a remodel of the rooms, and new landscaping around the dorms. Current residents of the boys’ dorm chose the model of the “test” room last year. They voted unanimously on one of the two configurations that placed the bunk beds above a desk area to create more space in the room. Michael Hall-Mounsey, president and CEO of the school, hopes to have a pair of boys live in the model room, and get feedback from them before renovating the rest of the dorm. The school may even decide to renovate another room based on the model that was not chosen, and have a pair of boys live in that one as well, to see how the two compare. The model room and the renovation of the boys’ dorm is just a small part of a larger plan to improve the school in future years. In addition to renovation of the boys’ dorm, plans call for improvements in the girls’ dorm, improving pedestrian access at Lower and Upper Campus, and beautifying both campuses with new landscaping and lighting. All renovations will also be in compliance with the newest Adults with Disability Act provisions, allowing for easier handicapped access. Before the renovation, Room 24 had desks on the left side, and bunk beds just inside the door. There were no cabinets, and only a small closet. The room left little space to move around. Today, both beds in the renovated Room 24 are suspended, with individual desks underneath. Drawer, closet space and a small seating area occupy the other side of the room. Senior John Olivo was the last person to live in Room 24 before it was renovated. He lived there last year, and remembers it being small even for just two people, and that it was cold, cramped, and crowded.